1. WHEN SHOULD I CLEAN MY GUTTERS? Take note of when the leaves on the trees around your house drop each year. Most people in the San Francisco Bay Area aim to get their gutters cleaned before the rainy season starts or shortly thereafter. We start getting gutter cleaning calls as early as August and September, peaking October-November, and then into December, January and February. Often your gutters will need to be cleaned more than once a season, so be sure to keep an eye on debris accumulation as well as any water overflowing from gutters. 2. 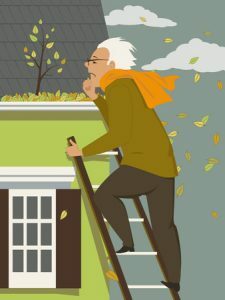 SHOULD I CLEAN MY GUTTERS MYSELF OR ASK A PROFESSIONAL BAY AREA GUTTER CLEANER? Consider your motivation levels, time for the project, confidence, access to necessary equipment and and safety risks involved. When hiring professional gutter cleaners, make sure they have insurance. Read about the importance of contractor insurance and how it will save you from an unwanted lawsuit. 3. HOW DO I CLEAN MY GUTTERS? Using hands, scoops and poles are the most common ways to remove debris. For houses located in areas of heavy tree coverage such as Piedmont, Montclair and the Hills of Berkeley and Oakland, motorized blowers can be useful, especially for pesky leaves and pine needles. 4. HOW DO I SAFELY ACCESS MY GUTTERS? 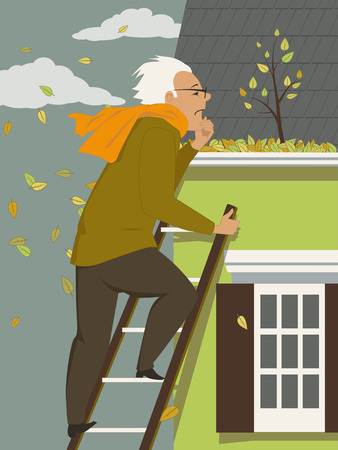 If your property is one story, a ladder should be sufficient enough to reach your gutters or climb onto your roof. However, if your property is multi-story, a longer ladder may be required. Whenever doing work involving a ladder, it is critical to follow proper safety procedures. Is your roof steep or flat? Sometimes you can just walk on your roof. Steeper roofs can require significant ladder work. 5. IS IT SAFE TO CLEAN MY OWN GUTTERS? Are you physically fit enough to be climbing ladders, bending, kneeling and scooping debris? How high are your gutters? Are there awkward angles or hard-to-reach areas? Is your house on a slope? We recommend hiring professional Bay Area gutter cleaners if cleaning your gutters would in any way put your safety at risk. 6. HOW WILL I DISPOSE OF THE GUTTER DEBRIS? Whether you clean your gutters or you have them professionally cleaned, you’ll need to plan where all that debris will go. Gutters can accumulate all sorts of debris, including leaves, needles, soil, sand, roofing material, moss, twigs, etc. At an Alameda gutter cleaning we recently did we found downspouts clogged with sea shells! Maybe a seagull had brought the shells. At another house half a dozen children’s toy balls were blocking various downspouts. Most professional cleaning services do not haul the debris away (unless specifically requested). You’ll want to leave enough space in your green bin or perhaps plan to throw it into a tree covered area on your property to compost naturally. 7. IS THERE A WAY TO PREVENT DEBRIS FROM ACCUMULATING IN THE GUTTERS? While it’s impossible to prevent every single piece of debris from entering your gutters, trimming nearby trees and relocating large plants may help alleviate the level of debris in your gutters. If you have areas of significant tree coverage near your home, gutter guards can be a great investment and way to protect your property. If you are looking to have your gutters cleaned, A-1 The Clear Choice can help you. We are a San Francisco Bay Area based company that specializes in cleaning gutters and other cleaning services for your home. We serve residents located in Alameda, Marin and Contra Costa. See what our customers are saying on Yelp and Angie’s List. Give us a call today at 510-914-5214 and request a free estimate!